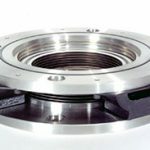 Vibration Isolators - National Electrostatics Corp.
NEC vibration isolators are designed to mount between a turbo molecular pump or cryopump and a vacuum system. They significantly reduce vibration transmitted to target chambers, microscopes, wafer processing chambers, end stations, or other vacuum apparatus that must be kept motionless. The vibration isolator consists of two vacuum flanges separated by a compliant large-aperture welded bellows and a set of low profile elastomer vibration isolators. 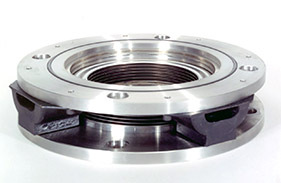 In all flange sizes and versions, the aperture of the bellows has been chosen to maximize conductance and clearance and to minimize interference with flange hardware. 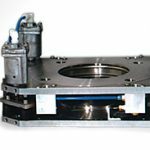 Using our standard Model VI-1 isolator, for typical turbo pumps, it is possible to reduce equipment vibration to levels required for sub micron resolution processes. The VI-1 also significantly reduces total vibration from a cryopump system, even though it cannot attenuate frequency components below about 20-40Hz. For a more sensitive isolator that can isolate vibrations as low as 2Hz – essentially eliminating the effect of cryopump vibration – we recommend our Model VI-2. The VI-2 is designed for the most demanding applications and uses a pneumatic suspension system to dramatically reduce the vibrations transmitted to sensitive systems. 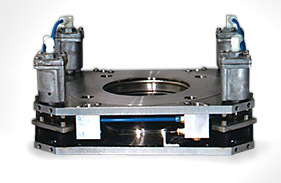 The VI-2 has the same basic design as the VI-1, with welded metal bellows and a set of elastomer isolators. However, the VI-2 mechanically couples the elastomer isolaters to ultra-low friction pneumatic cylinders. Automatic leveling valves control the flow of compressed air to ballast tanks, which in turn maintain air pressure in the pneumatic cylinders. Once these are pressurized, the cryopump rides on a cushion of air, having an effective spring constant in the range of 7 to 30 lbs./in depending on flange size. This is typically several hundred times more compliant than the equivalent VI-1 isolator, resulting in correspondingly better isolation. Generally, each VI-2 has two leveling systems, allowing for unbalanced loads in one direction.